The above info came from Emily, and was edited by yours truly (contact me). 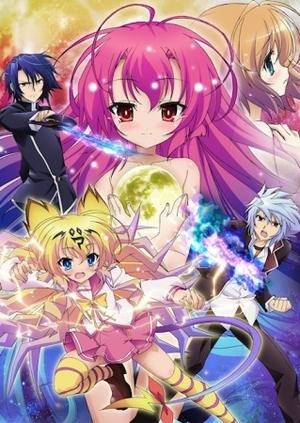 Itsuka Tenma no Kuro Usagi is about a boy named Taito who's currently a freshman entering Miyasaka High, along with his friend Haruka Shigure. Though the beginning, he's shown to be receiving strange dreams of when he was a child, at the park playing with a girl. And to solemnly swear to always be with her, and with that the girl bites him, giving him her poison to seal the promise. And although Taito cannot recognize this phenomenon, the student council president of the school, Gekkou Kurenai along with his partner (whom he calls a servant) Mirai Andou may have something to do with it. One day, while walking home after school, Taito is then hit by a truck after attempting to save Mirai Andou, and ends up getting his head decapitated. But oddly enough, he finds himself still conscious, with Mirai Andou and anyone who saw that accident totally petrified and such. And unfortunately, unable to discover why, Taito simply ends up running off to who-knows-where, questioning this strange phenomenon. However, that's when he then realizes how this was happening; He remembers of the young girl as the young vampire named Saitohimea, in his past/dreams who bites him, sealing a curse (of having 7 lives every 15 minutes) as a promise for their love towards each other. And with that, Saitohimea reappears at the park, reunited with Taito. But this doesn't last long, as they are suddenly interrupted by Gekkou Kurenai and Mirai Andou. This resulted in a huge battle, as where Taito stood no chance fighting against Gekkou's sword (called Spell error). However, they're then interrupted by another attacker-Hinata, the one who has originally kidnapped and stolen Himea away from Taito during the past. He was also the one responsible for erasing all Taito's memories of Himea, and now threatens him to return Himea to him once more. Along with unlikely allies, Kurenai Gekkou, Miyasaka High's student council president and a genius bent on avenging his parents. As well as Andou Mirai, a cute lightning demon and familiar of Gekkou, they have to contend against Gekkou's younger twin brother, Kurenai Hinata, who seeks to resurrect the powerful Vampire (Most Ancient Sorcerer) Bahlskra. Unknown to them, their destinies were already woven and foretold in an ancient prophecy of epic proportions. The above description came from Emily, and was edited by yours truly (contact me).